Extreme Surfing Video! is the ultimate mobile video collection of extreme surfing! Love surfing? Want to see amazing surfing footage from the best of the best? 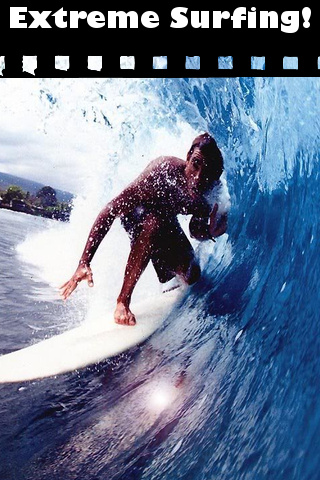 With Extreme Surfing Video!, you will see extreme surfing by surfing pros - all on your iPhone, iPad, or iPod Touch! Extreme Surfing Video! also allows you to chat right within the application - you can immediately share your thoughts and comments on a moderated discussion panel. Share your comments with others! Extreme Surfing Video! is part of the Video! is the ultimate series of the most spectacular and outlandish videos you will ever find, featuring nuclear weapons, fast cars, explosions, UFOs, ghosts, zombies, vampires, sharks, and dinosaurs! If you like Extreme Surfing Video! be sure to check out other videos in the Video! series including Ghost Video!, UFO Video!, Zombie Video!, Vampire Video!, and Alien Video!. - Over A 100ft Wave? - Wipeout Of The Week? Extreme Surfing Video! is brought to you by Interave Media, creators of the best of iPhone mobile video applications. Video application series include: Vintage Videos, ArtVideo, Cartoon Classics, ExpertVideo, Cute Clips, Video!, BeVideo, Faith Video, DanceVideo, FitVideo, LegalAid Video, Language Video, and Travel Video.